Enzymes facilitate and are needed for every biochemical reaction taking place in our bodies. Enzymes themselves are made up of proteins and are found in all living cells. Metabolic enzymes speed up the detoxification process and are found in the liver, pancreas, gallbladder and other organs. That is why it is important to look at the liver enzymes on blood work ups. It gives doctors an indication of the stress on the liver. Looking at pancreatic enzymes, such as lipase and amylase, tells us the stress on the pancreas. Digestive enzymes are secreted along the digestive tract to breakdown food into absorbable nutrients and waste products. Digestive enzymes break down proteins, fats, carbohydrates and fiber into smaller and smaller particles in order to be absorbed through the mucous lining of our intestines. So, we can eat healthy food, but more importantly, are we breaking down and absorbing it? If we are consuming healthy foods, but still not feeling well, it could be an enzyme deficiency. Food Enzymes are introduced to the body through food. 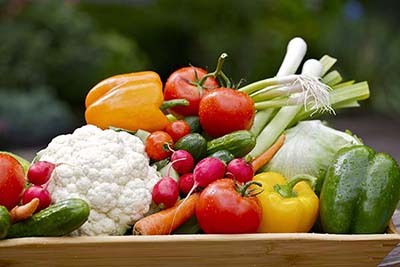 Vegetables and fruits are full of digestive enzymes. Cooking and processing these foods denatures or destroys these enzymes. Therefore fruits should be eaten raw and vegetables should be lightly cooked (steamed or sauteed) just so a fork can pierce it. Many times digestive enzymes need to be supplemented because people no longer produce them due to digestive abuses in the past or aging. As we age we create fewer enzymes. Also, each blood type secretes different enzymes and therefore we should eat food matching them. Enzymes breakdown invaders, like parasites, fungi, viruses and bacteria. At our clinic, we use enzymes to facilitate the breakdown of viruses often difficult to eradicate by conventional medicine (e.g., HPV (human papillomavirus virus) and fungi). Bacteria, viruses and fungi are made up of protein and the shell that protects a virus is also made of up proteins. The enzyme protease breaks down protein, therefore helping to eliminate some of these pathogens. Protease breaks down protein. Symptoms may include constipation, hypertension, insomnia, hearing problems, parasites, gingivitis etc…. Lipase breaks down fat. Symptoms may include arthritis, bladder problems, acne, gallbladder stress, prostate problems, psoriasis, hay fever etc…. Amylase breaks down carbohydrates. Symptoms may include rash, hypoglycemia, depression, allergies, PMS, hot flashes, fatigue, inflammation, etc…. Cellulase breaks down fiber. Symptoms may include malabsorption, gas, bloating and gluten intolerance. Enzyme therapy is an important part of overall health. Quality and potency is important, as with all supplements, to be effective. Remember, it is not about what we eat, but what we absorb. Enzymes can help with the breakdown and absorption of nutrients.